HUPlayer for iOS is a video player running on iPhone, iPad, and iPod devices. It supports playing FLV, MP4, WebM, AVI, MP3, MKV, M4A, M4V, AAC, 3GP, RMVB. MPG, MPEG and DIVX formats. It also supports playing DRM-X 3.0 protected Audio/Video files (MP3, MP4, WMA, and WMV). HUPlayer for iOS support iOS 7.0 or later version, and support the latest 64 bit iPhone and iPad. Support common Audio/Video formats, HUPlayer for iOS plays almost any format as HUPlayer on your PC. HUPlayer for iOS support high-definition video, it gives user better experience. It also supports nondestructive quality, acceleration or deceleration playing. Playing DRM-X 3.0 protected high quality premium content. Current support playing protected MP4, WMV, WMA and MP3 formats. Apple’s smartphone market occupies an important shares in the world, especially in Europe and the United States and China's high-end mobile phone users, and also some of the enterprise users. iOS mobile phones and mobile devices has a huge commercial market. Haihaisoft DRM-X 3.0 will bring content providers to further more iOS customers, and to ensure DRM-X protected digital content can be securely distributed to the iPhone or iPad. End users can watch the encrypted videos anytime and anywhere. 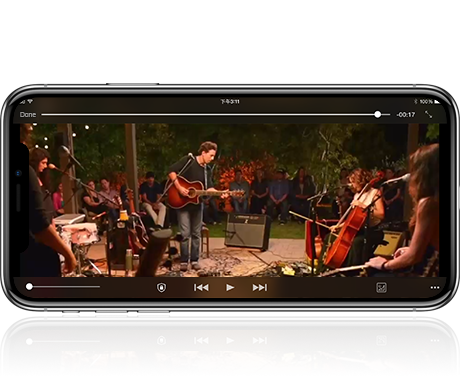 Haihaisoft provide iOS Media Player customized services. Content providers can have their own Media Player, so as to meet content provider’s special business requirements, and to provide the end user satisfaction and personalized service. The customize iOS Media Player features including the put your company name and logo in Reader, customize color theme, functions for your specific business use, Integrate with your App, and Embed your online store. Why do you need a customized Player? HUPlayer for iOS is the most powerful media player. Your customized player can play almost all kind of multimedia formats and show your brand, customers will never forget you. You can choose customize your company link or icon in the Menu, it attracts more customers visit your website. With your own Media Player, it can greatly increase the value of your company. It impresses customers by providing products with your own Media Player. For example, your company needs to customized iOS player read movie text scripts from your server, or have a customized playlist, or your company's video library in the customized player. In customized iOS Player, you can embed your website. It enables users to shopping and playing in the same App. It provides customers with a better user experience. The customized player can listen user clicks on a video link in the embedded web page, then it can download the video file or online play the video file immediately. Which kind of customized player service will you be looking for?